Astrocytes have been recognized to be versatile cells participating in fundamental biological processes that are essential for normal brain development and function, and central nervous system repair. Here we present a rapid procedure to obtain pure mouse astrocyte cultures to study the biology of this major class of central nervous system cells. Schildge, S., Bohrer, C., Beck, K., Schachtrup, C. Isolation and Culture of Mouse Cortical Astrocytes. J. Vis. Exp. (71), e50079, doi:10.3791/50079 (2013). Astrocytes are an abundant cell type in the mammalian brain, yet much remains to be learned about their molecular and functional characteristics. In vitro astrocyte cell culture systems can be used to study the biological functions of these glial cells in detail. This video protocol shows how to obtain pure astrocytes by isolation and culture of mixed cortical cells of mouse pups. The method is based on the absence of viable neurons and the separation of astrocytes, oligodendrocytes and microglia, the three main glial cell populations of the central nervous system, in culture. Representative images during the first days of culture demonstrate the presence of a mixed cell population and indicate the timepoint, when astrocytes become confluent and should be separated from microglia and oligodendrocytes. Moreover, we demonstrate purity and astrocytic morphology of cultured astrocytes using immunocytochemical stainings for well established and newly described astrocyte markers. This culture system can be easily used to obtain pure mouse astrocytes and astrocyte-conditioned medium for studying various aspects of astrocyte biology. Astrocytes are a very abundant cell type in the central nervous system (CNS). The ratio of astrocytes to neurons is 1:3 in the cortex of mice and rats, whereas there are 1.4 astrocytes per neuron in the human cortex 1. Interest in astrocyte function has increased dramatically in recent years. A key function of astrocytes is their role in providing structural and metabolic support to neurons 2,3. Newly discovered roles for astrocytes cover a broad spectrum of functions. These include guiding the migration of developing axons and certain neuroblasts during development4-6, functions in synaptic transmission, synapse strength and information processing by neural circuits 7-9, roles in blood-brain barrier (BBB) formation 10 and integrity 11-13 and regulation of the cerebrovascular tone 14. Another major feature of astrocytes is their response to injury. Under pathological conditions astrocytes become reactive and further upregulate the expression of the intermediate filament glial fibrillary acidic protein (GFAP) and inhibitory extracellular matrix (ECM) proteins 15,16. Reactive astrocytes demarcate the injury site from healthy tissue by forming a glial scar, which consists mainly of astrocyte secreted ECM proteins of the chondroitin sulfate proteoglycan (CSPG) family, the major factors that inhibit axonal regeneration after CNS injury 15-17. Astrocytes originate from radial glial (RG) cells during late embryogenesis and early postnatal life. After astrocyte specification has occurred, astrocyte precursors migrate to their final positions, where they begin the process of terminal differentiation. In vivo, astrocytes appear to be mature three to four weeks after birth as indicated by their typical morphology 18,19. A subpopulation of RG cells convert into subventricular zone astrocytes (type B cells). Both, RG and type B cells function as astrocyte-like neural stem cells (NSCs) during development and in the adult, respectively. Like astrocytes, RG and type B cells also express the astrocyte-specific glutamate transporter (GLAST), brain lipid-binding protein (BLBP), and GFAP, indicating that these markers cannot be exclusively used to specifically label adult astrocytes. In contrast to adult parenchymal astrocytes, which do not divide in the healthy brain, RG and type B cells exhibit stem cell potential such as the capacity to self-renew. Dysregulation of astrocytes has been implicated in numerous pathologies, including Alzheimer's disease 20,21, Huntington's disease 22, Parkinson's disease 23, Rett syndrome 24 and Alexander's disease 25. Moreover, astrocytes react to all insults of the CNS, leading to astrocyte activation and astrocytic glial scar formation 16,26. The astrocytic glial scar that forms following brain trauma or spinal cord injury is thought to be the prime barrier preventing neuronal regeneration 15. The development of reliable methods to isolate and maintain purified populations of cells has been essential to our understanding of the nervous system. Pioneering work by McCarthy and de Vellis enables investigators to date to prepare nearly pure cultures of astrocytes from neonatal rat tissue 27. Much has been learned about astrocyte biology using this method, which is presented here in a slightly modified form for isolating mouse cortical astrocytes. Complementing in vivo studies, astrocytes as well as conditioned medium obtained using the described in vitro culture, are valuable tools to further gain insights into astrocyte functions. Mixed cortical cell isolation for astrocyte cultures can be performed using P1 to P4 mouse pups. In order to achieve proper astrocyte density it is necessary to use 4 mouse pup cortices per T75 tissue culture flask. Therefore, volumes in the following protocol are calculated for a cell preparation using 4 mouse pups. Before starting the dissection procedure, prewarm 30 ml of astrocyte culture media (DMEM, high glucose + 10% heat-inactivated fetal bovine serum + 1% Penicillin/Streptomycin; see table) to 37 °C. Coat one T75 flask with 20 ml of poly-D-lysine (PDL) at a concentration of 50 μg/ml in cell culture grade water for 1 hr at 37 °C in the CO2 incubator. For the dissection procedure, prepare all necessary reagents and materials. You will need: surgical scissors, smooth fine forceps, flat tip forceps, paper towels, waste bag, 70% ethanol and 2 dissecting dishes (3.5 cm diameter) on ice filled with 2 ml HBSS each. Gently hold and spray the head and neck of the mouse pup with 70% ethanol. The animal is sacrificed by decapitation using the scissors. Perform a midline incision, posterior to anterior, along the scalp to reveal the skull. Cut the cranium carefully from the neck to the nose. Two additional cuts are performed to allow further access to the brain: The first cut is made anterior of the olfactory bulbs, the other one inferior of the cerebellum to disconnect the cranium from the skull base. Using the flat tip forceps, the cranial flaps are gently flipped to the side and the brain is taken out and placed into the first dissecting dish filled with HBSS. Place the dish back on ice and continue harvesting all 4 brains. The remainder of the dissection procedure is performed under a stereomicroscope. First, the olfactory bulbs and the cerebellum are removed using the fine dissecting forceps (Figure 1B). In order to retrieve the cortices, grab the posterior end of the brain with the fine forceps, perform a midline incision between the hemispheres, insert a second set of forceps to the created grove and peel away the plate-like structure of the cortex from the brain. Carefully dissect the meninges from the cortex hemispheres by pulling with the fine forceps (Figure 1D'). This step avoids contamination of the final astrocyte culture by meningeal cells and fibroblasts. Transfer the prepared cortex hemispheres into the second dish filled with HBSS and return it onto ice. Continue accordingly with all 4 cortices. Finally, cut each cortex hemisphere into small pieces using sharp blades (approximately 4 to 8 times). Under sterile conditions, transfer cortex pieces into one 50 ml Falcon tube and add HBSS to a total volume of 22.5 ml. Add 2.5 ml of 2.5 % trypsin, mix and incubate the tissue in the water bath at 37 °C for 30 min. Mix by occasional shaking every 10 min. Centrifuge for 5 min at 300 x g to pellet cortex tissue pieces. Carefully remove supernatant by decantation. In order to avoid losing the tissue pellet you may mechanically retain it using a pipet. Dissociate the tissue into a single cell suspension by adding 10 ml astrocyte plating medium and vigorous pipetting using a 10 ml plastic pipette until tissue pieces are dissociated into single cells (20 to 30 times). Adjust volume to 20 ml using astrocyte plating medium. You can proof the dissociation of the cortex tissue into single cells by counting using a hematocytometer. One preparation of 4 mouse pup cortices should yield 10-15 x106 dissociated single cells. Aspirate PDL from the T75 culture flask, plate the dissociated single cell suspension and incubate at 37 °C in the CO2 incubator. Change the medium 2 days after plating of the mixed cortical cells and all 3 days thereafter. After 7 to 8 days, when astrocytes are confluent and overlaying microglia sit exposed on the astrocyte layer or are already detached from the astrocyte layer (Figure 2), shake the T75 flask at 180 rpm for 30 min on an orbital shaker to remove microglia. Discard the supernatant containing microglia or if you wish to culture and examine microglia, spin it down and plate for culture 28,29. Add 20 ml fresh astrocyte culture medium and continue by shaking the flask at 240 rpm for 6 hr to remove oligodendrocyte precursor cells (OPC). Since some OPCs will not completely detach from the astrocyte layer, continue to shake vigorously by hand for 1 min in order to prevent OPC contamination. Discard the supernatant or spin it down and plate, if you wish to culture OPCs 29. Rinse the remaining confluent astrocyte layer twice with PBS, aspirate the PBS, add 5 ml trypsin-EDTA and incubate in the CO2 incubator at 37 °C. Check detachment of astrocytes every 5 min and enforce detachment of astrocytes by hitting the flask against the palm of your hand (2-3 times). After astrocytes are detached from the culture flask, add 5 ml of astrocyte culture medium, spin cells at 180 x g for 5 min, aspirate supernatant and add 40 ml fresh astrocyte plating medium. One T75 tissue culture flask should yield around 1x106 cells after the first cell split. Plate cells in two T75 culture flasks and incubate at 37 °C in the CO2 incubator. Change the medium every 2 to 3 days. 12-14 days after the first split astrocytes are plated in the appropriate cell concentration 24-48 hr before performing the experiment. One T75 tissue culture flask should yield around 1.5-2 x106 cells after the second cell split. Upon isolation of the complete mouse brain (Figure 1A), the cerebellum and the olfactory bulbs have to be removed (Figure 1B). 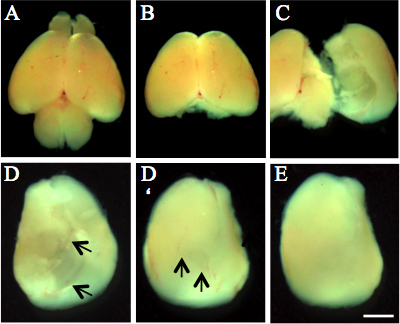 The cortices are peeled of the mouse brain stem (Figure 1C) and meninges of the individual cortex (Figure 1D') are carefully removed (Figure 1E). Meninges are obvious by the meningeal artery system and incomplete removal results in contamination of the final astrocyte culture by meningeal cells and fibroblasts. After plating of the mixed cortical cell suspension, some astrocytes already attach to the culture flask within 24 hr (Figure 2A). However, the cell culture supernatant will contain cell debris and dying neurons for the first 3 to 5 days (Figure 2A-C), as the culture medium favors survival and growth of glial cells. Once astrocytes are confluent and microglia sit exposed on the astrocyte layer, usually at day 7 after isolation of mixed cortical cells, astrocytes should be separated from microglia and OPCs by shaking (Figure 2D). 2 days after the first split cells show astrocyte morphology. At this point astrocyte density is low and astrocytes are voluminous (Figure 2E, black arrows mark one cell). The expected yield at this point is low with about 4-6 x105 cells per T75 tissue culture flask. However, the cells still proliferate and mature in culture at this timepoint. Astrocytes are usually used for experiments at day 21 to 28 (Figure 2F) to ensure a mature phenotype of isolated astrocytes. At this point the expected yield is about 1.5-2 x106 cells per T75 tissue culture flask. The astrocyte culture purity has been characterized by electron microscopy morphological studies, cell marker expression and pharmacological responsiveness 27. Contamination of the astrocyte culture can be examined by using marker for microglia (IBA-1) and OPCs (O4). The obtained astrocyte culture purity and maturity should be examined by immunocytochemical examination using an antibody against the GFAP protein. It is expected that the majority of the cells show an intensive, filamentous signal (Figure 3). Our isolation and culture method of cortical astrocytes resulted in an astrocyte purity of greater than 98%, revealed by using an antibody against the GFAP protein (Figure 3). If the procedure was successful, contaminating cells are rare (<2%) and contain microglia and OPCs, which can be stained by using IBA-1 and O4, respectively. 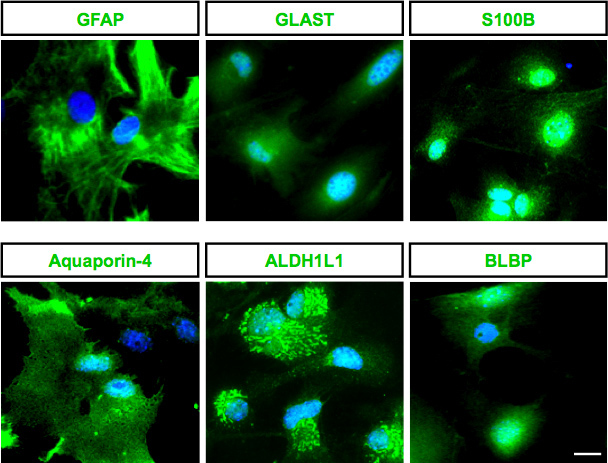 If desired, further analysis of other astrocyte markers, such as Aquaporin-4, BLBP, S100B and GLAST may be used. In addition to GFAP, these markers were all expressed by the 28 days old astrocyte cultures. Recent gene expression profiling of purified astrocyte populations revealed new potential astrocyte markers, such as the folate metabolic enzyme ALDH1L1 30,31, which is also expressed by the majority of the isolated cortical astrocytes (Figure 3). Figure 1. Dissection of postnatal (P3) mouse cortex. A) Whole brain. B) Brain after removal of olfactory bulbs and cerebellum. C) Isolation of cortices by peeling off the plate-like structure of the cortex from the brain. D, D') Cortex from ventral and dorsal site with meninges (black arrows indicate meningeal arteries). E) Cortex without meninges. Scale bar, 1.5 mm. Figure 2. Morphological overview of isolated mixed cortical cells and pure astrocyte culture at different timepoints after isolation. A) 1 day after plating of mixed cortical cells. First astrocytes are attached to the bottom of the flask (black arrows) and dying neurons are in the supernatant. B) 3 days after plating of mixed cortical cells. Astrocyte layer is forming (black arrows). Neurons are almost absent. C) 5 days after plating of mixed cortical cells. First microglia and OPCs on top of a astrocyte layer (black arrows). D) 7 days after plating of mixed cortical cells. Astrocyte layer is completely confluent. E) After removing microglia and OPCs by vigorous shaking and 2 days after splitting, attached cells show astrocyte morphology with low density (arrows indicate one cell). F) Astrocyte layer shows high density 2 weeks after the first split. Scale bar, 10 μm. Figure 3. Purity of primary astrocyte culture. Immunolabeling of primary mouse astrocyte cultures with the markers GFAP, GLAST, S100B, Aquaporin-4, ALDH1L1 and BLBP (all green) revealed pure primary astrocyte culture. Nuclei are stained with 4',6'-diamidino-2-phenylindole (DAPI) (blue). Scale bar: 10 μm. The method outlined here is based on the astrocyte culture preparation from rodent neonatal brains, originally described by McCarthy and de Vellis in 1980 27. The modified method of the isolation and culture of cortical astrocytes from postnatal P1 to P4 mouse brain presented here is fast, yields pure primary astrocytes and is highly reproducible. 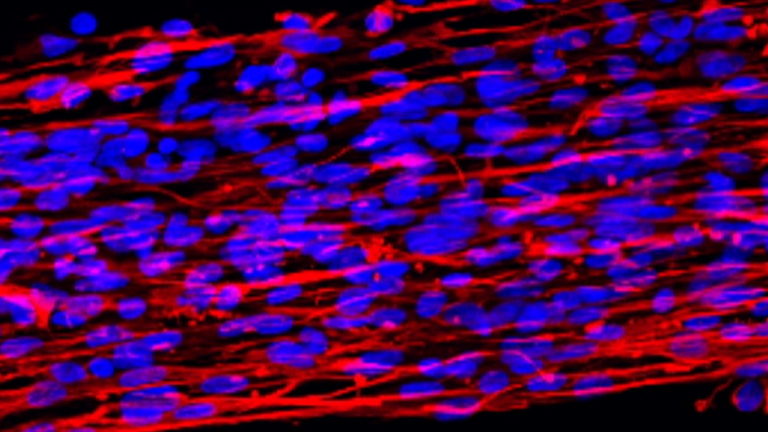 This technique can easily be transferred to isolate astrocytes from other species, such as from rat or pig and from other brain regions, such as the spinal cord. Whereas astrocyte progenitor cell isolation from neonatal brain by the McCarthy and deVellis method generates highly proliferative cells, the cell proliferation and propagation of isolated astrocytes of postnatal P1-P4 mouse pups is limited. After splitting astrocytes once at 7 days in vitro (DIV), they will grow to confluency and mature. In vivo, most astrocyte proliferation is largely complete by P14 32. Here, we suggest to use astrocytes for experiments at day 21 to 28 DIV (Figure 2F) to ensure the mature phenotype of isolated astrocytes. Due to the intrinsic restraint to proliferate astrocyte cultures should not be splitted more than 3 times. Critical steps in the described isolation method are the digestion of cortices and the following trituration of the digested tissue for obtaining the single cell suspension. Therefore, it is necessary to optimize trypsin concentration and digestion time in order to obtain a single cell suspension after trituration of the brain cortex tissue for 20-30 times. In order to minimize variation trypsin should be aliquoted and freeze-thaw cycles should be avoided. The described procedure relies on plating the mixed cortical cells on PDL-coated culture flasks, which assures the binding of astrocytes and promotes a confluent astrocyte layer several days after plating. While PDL-coating is not necessary for astrocyte maintenance after their separation from microglia and oligodendrocytes, it may be performed for certain downstream applications such as immunofluorescene staining. Good timing of the first cell split is important for cell integrity and yield. If astrocytes are cultured beyond they reached confluency, you may lose the majority of cells due to insufficient detachment during the first cell split. This cannot be overcome by increasing the time for detachment, since extensive incubation time with trypsin negatively influences cell integrity. In contrast, plating the cortical cell suspension too scarcely will result in insufficient formation of a confluent astrocyte cell layer. The best time for the first cell split is at 7 to 8 days after plating of mixed cortical cells, when astrocytes are confluent and microglia cells sit on the topmost position of the astrocyte layer. In the described cortical cell culture, astrocytes show cellular heterogeneity (Figure 3), as it has been described for astrocytes in vivo 33,34. However, defining diverse astrocyte morphology and functionality has been hampered by the limited number of markers to identify and distinguish potentially heterogeneous astrocyte subtypes. A well characterized marker of mature fibrous and reactive astrocytes is GFAP. However, GFAP is barely expressed by mature protoplasmic astrocytes, limiting its use as a marker for all astrocytes and it is also expressed by RG cells during development and by B cells in the adult, restricting its use as a stage-specific marker. Other markers of astrocytes, including GLAST, ALDH1L1 or BLBP, are also expressed by immature astrocytes and therefore do not exclusively mark mature astrocytes. Finally, mature astrocyte markers such as GFAP, Aquaporin-4, and S100B (Figure 3) are increasingly up-regulated during postnatal maturation. In our hands, astrocyte cultures at an age of 4 weeks have characteristics of mature astrocytes in vivo. Using primary astrocyte cultures we could identify the molecular mechanism how the blood born protein fibrinogen induces astrocyte activation 17. Our studies revealed that fibrinogen is a carrier of latent TGF-β. Treatment of primary astrocytes with fibrinogen led to active TGF-β formation and the activation of the TGF-β/Smad signaling pathway in astrocytes 17,26. These results have been confirmed using fibrinogen injections in vivo. Furthermore, astrocytes control other cell types by the secretion of substances, which can be analyzed by harvesting astrocyte-conditioned medium and applying this conditioned medium to other cell types. We previously used astrocyte-conditioned medium to analyze in a functional assay how conditioned medium of fibrinogen-treated astrocytes affects neurite outgrowth. Reactive astrocytes express and secrete proteins of the CSPG family, which inhibit neurite outgrowth 16. Indeed, conditioned medium from fibrinogen-treated astrocytes significantly decreased both neurite length and the percentage of cells showing neurite outgrowth 17. The isolation and culture of cortical astrocytes described in this protocol provides a powerful tool for investigating astrocyte biology, since their manageability in diverse applications can greatly complete their investigation in vivo. However, it should be kept in mind that the obtained astrocytes have been cultured in vitro and while they reflect many astrocyte characteristics, they also differ from in vivo astrocytes. Therefore, other methods of direct selection and isolation of astrocytes by immunopanning 35 or antibody-based FACS isolation 36 represent new avenues to further investigate the fundamental properties of astrocytes. Supported by the Fazit Foundation Graduate fellowship to S.S., the Federal Ministry of Education and Research (BMBF 01 EO 0803) to K.B. and the European Commission FP7 Grant PIRG08-GA-2010-276989, NEUREX, and the German Research Foundation Grant SCHA 1442/3-1 to C.S. The authors have no conflicting financial interests. Nedergaard, M., Ransom, B., Goldman, S. A. New roles for astrocytes: redefining the functional architecture of the brain. Trends Neurosci. 26, 523-530 (2003). Belanger, M., Allaman, I., Magistretti, P. J. Brain energy metabolism: focus on astrocyte-neuron metabolic cooperation. Cell Metab. 14, 724-738 (2011). Allen, N. J., Barres, B. A. Neuroscience: Glia - more than just brain glue. Nature. 457, 675-677 (2009). Ballas, N., Lioy, D. T., Grunseich, C., Mandel, G. Non-cell autonomous influence of MeCP2-deficient glia on neuronal dendritic morphology. Nat. Neurosci. 12, 311-317 (2009). Jacobs, S., Nathwani, M., Doering, L. C. Fragile X astrocytes induce developmental delays in dendrite maturation and synaptic protein expression. BMC Neurosci. 11, 132 (2010). Kaneko, N., et al. New neurons clear the path of astrocytic processes for their rapid migration in the adult brain. Neuron. 67, 213-223 (2010). Min, R., Nevian, T. Astrocyte signaling controls spike timing-dependent depression at neocortical synapses. Nat. Neurosci. (2012). Eroglu, C., Barres, B. A. Regulation of synaptic connectivity by glia. Nature. 468, 223-231 (2010). Sasaki, T., Matsuki, N., Ikegaya, Y. Action-potential modulation during axonal conduction. Science. 331, 599-601 (2011). Bozoyan, L., Khlghatyan, J., Saghatelyan, A. Astrocytes control the development of the migration-promoting vasculature scaffold in the postnatal brain via VEGF signaling. J. Neurosci. 32, 1687-1704 Forthcoming. Alvarez, J. I., et al. The Hedgehog pathway promotes blood-brain barrier integrity and CNS immune quiescence. Science. 334, 1727-1731 (2011). Abbott, N. J., Ronnback, L., Hansson, E. Astrocyte-endothelial interactions at the blood-brain barrier. Nat. Rev. Neurosci. 7, 41-53 (2006). Tao-Cheng, J. H., Nagy, Z., Brightman, M. W. Tight junctions of brain endothelium in vitro are enhanced by astroglia. J. Neurosci. 7, 3293-3299 (1987). Gordon, G. R., Choi, H. B., Rungta, R. L., Ellis-Davies, G. C., MacVicar, B. A. Brain metabolism dictates the polarity of astrocyte control over arterioles. Nature. 456, 745-749 (2008). Silver, J., Miller, J. H. Regeneration beyond the glial scar. Nat. Rev. Neurosci. 5, 146-156 (2004). Schachtrup, C., Moan, N. L. e, Passino, M. A., Akassoglou, K. Hepatic stellate cells and astrocytes: Stars of scar formation and tissue repair. Cell Cycle. 10, 1764-1771 (2011). Schachtrup, C., et al. Fibrinogen triggers astrocyte scar formation by promoting the availability of active TGF-beta after vascular damage. J. Neurosci. 30, 5843-5854 (2010). Bushong, E. A., Martone, M. E., Jones, Y. Z., Ellisman, M. H. Protoplasmic astrocytes in CA1 stratum radiatum occupy separate anatomical domains. J. Neurosci. 22, 183-192 (2002). Ogata, K., Kosaka, T. Structural and quantitative analysis of astrocytes in the mouse hippocampus. Neuroscience. 113, 221-233 (2002). Dabir, D. V., et al. Impaired glutamate transport in a mouse model of tau pathology in astrocytes. J. Neuroscience. 26, 644-654 (2006). Wisniewski, H. M., Wegiel, J. Spatial relationships between astrocytes and classical plaque components. Neurobiol. Aging. 12, 593-600 (1991). Shin, J. Y., et al. Expression of mutant huntingtin in glial cells contributes to neuronal excitotoxicity. J. Cell Biol. 171, 1001-1012 (2005). Wakabayashi, K., Hayashi, S., Yoshimoto, M., Kudo, H., Takahashi, H. NACP/alpha-synuclein-positive filamentous inclusions in astrocytes and oligodendrocytes of Parkinson's disease brains. Acta Neuropathol. 99, 14-20 (2000). Lioy, D. T., et al. A role for glia in the progression of Rett's syndrome. Nature. 475, 497-500 (2011). Quinlan, R. A., Brenner, M., Goldman, J. E., Messing, A. GFAP and its role in Alexander disease. Exp. Cell Res. 313, 2077-2087 (2007). Beck, K., Schachtrup, C. Vascular damage in the central nervous system: a multifaceted role for vascular-derived TGF-beta. Cell Tissue Res. 347, 187-201 (2012). McCarthy, K. D., de Vellis, J. 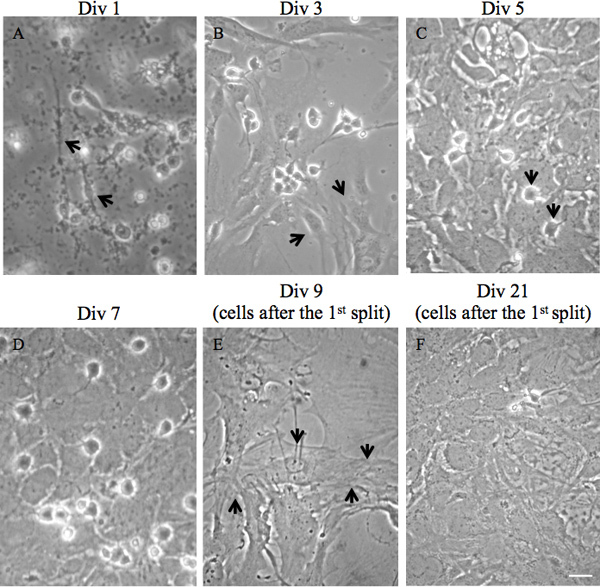 Preparation of separate astroglial and oligodendroglial cell cultures from rat cerebral tissue. J. Cell Biol. 85, 890-902 (1980). Siao, C. J., Tsirka, S. E. Tissue plasminogen activator mediates microglial activation via its finger domain through annexin II. J. Neurosci. 22, 3352-3358 (2002). Armstrong, R. C. Isolation and characterization of immature oligodendrocyte lineage cells. Methods. 16, 282-292 (1998). Cahoy, J. D., et al. A transcriptome database for astrocytes, neurons, and oligodendrocytes: a new resource for understanding brain development and function. J. Neurosci. 28, 264-278 (2008). Anthony, T. E., Heintz, N. The folate metabolic enzyme ALDH1L1 is restricted to the midline of the early CNS, suggesting a role in human neural tube defects. J. Comp. Neurol. 500, 368-383 (2007). Skoff, R. P., Knapp, P. E. Division of astroblasts and oligodendroblasts in postnatal rodent brain: evidence for separate astrocyte and oligodendrocyte lineages. Glia. 4, 165-174 (1991). Molofsky, A. V., et al. Astrocytes and disease: a neurodevelopmental perspective. Genes Dev. 26, 891-907 (2012). Zhang, Y., Barres, B. A. Astrocyte heterogeneity: an underappreciated topic in neurobiology. Curr. Opin. Neurobiol. 20, 588-594 (2010). Foo, L. C., et al. Development of a method for the purification and culture of rodent astrocytes. Neuron. 71, 799-811 (2011). Jungblut, M., et al. Isolation and characterization of living primary astroglial cells using the new GLAST-specific monoclonal antibody ACSA-1. Glia. 60, 894-907 (2012). Hi, I'm hoping you can tell me what antibodies you used for your GFAP and Aldh1l1 immunofluorescence. Thanks very much. we used the rat anti-GFAP antibody from invitrogen (#13-0300) and the rabbit anti-ALDH1L1 from abcam (#ab87117) for immunofluorescence on astrocytes. Hi, I really like to watch the video but I couldn't able to watch the video. I want to request to watch the video, so that that video could help me in my study. Thank you for the video. I have a few questions regarding culture maintenance. Is there a particular reason you maintain your astrocyte cultures up to 2 weeks after the first split? Do you continue to passage them a few times afterwards for multiple experiments? I find that my cultures change morphology after the second split and proliferate poorly. we isolate mixed cortical cells from P1 to P4 mouse pups. We keep the isolated cells for 3 to 4 weeks in culture to perform experiments with aged, mature astrocytes. This aged astrocytes express and secrete for example chondroitin sulfate proteoglycans (CSPGs) upon activation, whereas cells that are just cultured for some days express only low amounts of CSPGs. We mention in the protocol that the cell proliferation and propagation of isolated astrocytes of postnatal P1-P4 mouse pups is limited. We suggest to use astrocytes for experiments at day 21 to 28 DIV to ensure the mature phenotype of isolated astrocytes. Due to the intrinsic restraint to proliferate astrocyte cultures should not be splitted more than 3 times. Apologies for the late reply, as I just realised that my earlier response did not post here. Thank you for your reply and sharing your protocol. I have found it quite helpful in setting up my primary astrocyte cultures. Hello. I tried your protocol with adult mouse brain and I had a lot of debris attached and floating in the flask. Is there any way to prevent the amount of debris? Also, trying to dissociate into single cells by trituration was pretty difficult and still ended up with numerous cell clumps. Any tips for that part? Thanks. 1. Could we use diluted trypsin to remove microglia & oligodendrocytes if they attach weakly? 2. What is your Aquaporin4 antibody?